Add some horror to your ho ho ho with these 5 gruesome Christmas tales. A boy waits for Santa... with an axe! Who is the man in red and why is he stalking Randy? Sinister reindeer cause trouble for Billy. Santa finds more than presents under the tree. Forget shopping, try to escape the mall alive this Christmas Eve! 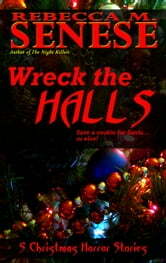 Includes: "Waiting for Santa", "The Santa Murders", "Billy and the Reindeer", "He Knows", and "A Very Zombie Christmas."